This post covers some foundations which are often misunderstood. Radiation emitted from a surface (or a gas) can go in all directions and also varies with wavelength, and so we start with a concept called spectral intensity. This value has units of W/m².sr.μm, which in plainer language means Watts (energy per unit time) per square meter per solid angle per unit of wavelength. (“sr” in the units stands for “steradian“). Most people are familiar with W/m² – and spectral intensity simply “narrows it down” further to the amount of energy in a direction and in a small bandwidth. 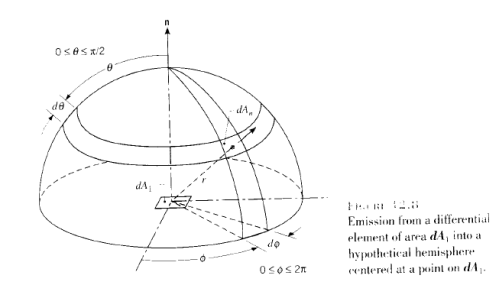 We’ll consider a planar opaque surface emitting radiation, as in the diagram below. The total hemispherical emissive power, E, is the rate at which radiation is emitted per unit area at all possible wavelengths and in all possible directions. E has the more familiar units of W/m². Most non-metals are “diffuse emitters” which means that the intensity doesn’t vary with the direction. For a planar diffuse surface – if we integrate the spectral intensity over all directions we find that emissive power per μm is equal to π (pi) times the spectral intensity. 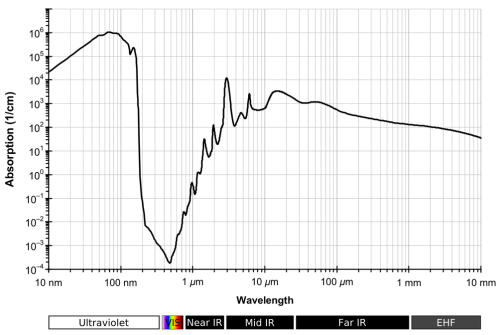 This result relies only on simple geometry, but doesn’t seem very useful until we can find out the value of spectral intensity. For that, we need Max Planck..
where T = absolute temperature (K); λ = wavelength; h = Planck’s constant = 6.626 x 10-34 J.s; k = Boltzmann’s constant = 1.381 x 10-23 J/K; c0 = the speed of light in a vacuum = 2.998 x 108 m/s. Note the rapid increase in radiation as temperature increases. Think of the blackbody as simply “the reference point” with which other emitters/absorbers can be compared. where σ=5.67 x 10-8 and T is absolute temperature of the body. The result above is for a blackbody. The material properties of a given body can be measured to calculate its emissivity, which is a value between 0 and 1, where 1 is a blackbody. where ε is the emissivity. 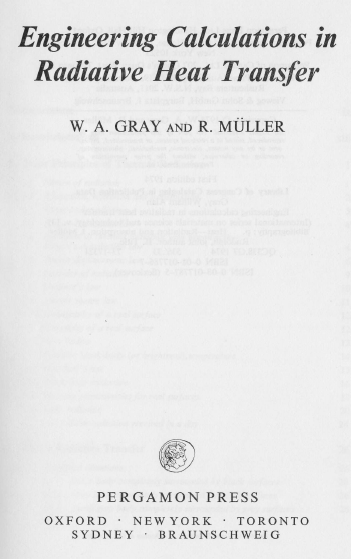 (See later section on emissivity and note 1). Note that so long as the Planck equation is true, the Stefan-Boltzmann relationship inevitably follows. It is simply a calculation of the total energy radiated, as implied by the Planck equation. The Planck law is true for radiant intensity into a vacuum and for a body in Local Thermodynamic Equilibrium (LTE). Or so many people who comment on blogs seem to think. Let’s take a closer look. 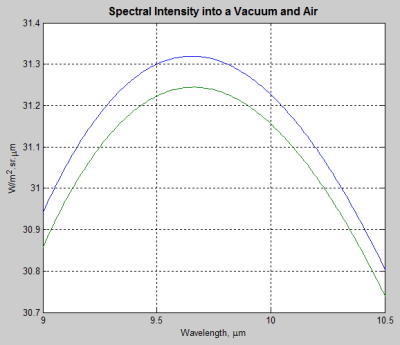 The speed of light in a vacuum, c0 = 2.998 x 108 m/s. This value appears in the Planck equation and so we need to cater for it when the emission of radiation is into air. The speed of light in air, cair = c0/n, where n is the refractive index of air = 1.0008. We can see that at the peak intensity the difference is around 0.3%. So the total energy radiated from a blackbody into air = 1.0016 x the total energy into a vacuum. This is why it’s a perfectly valid assumption not to bother with this adjustment for radiation into air. In glass it’s a different proposition.. The meaning, and requirement, of LTE (local thermodynamic equilibrium) is often misunderstood. It does not mean that a body is at the same temperature as its surroundings. Or that a body is all at the same temperature (isothermal). In a gas, the redistribution of absorbed energy occurs by various types of collisions between the atoms, molecules, electrons and ions that comprise the gas. Under most engineering conditions, this redistribution occurs quite rapidly, and the energy states of the gas will be populated in equilibrium distributions at any given locality. When this is true, the Planck spectral distribution correctly describes the emission from a blackbody.. When collisions control the populations of the energy levels in a particular part of an atmosphere we have only local thermodynamic equilibrium, LTE, as the system is open to radiation loss. When collisions become infrequent then there is a decoupling between the radiation field and the thermodynamic state of the atmosphere and emission is determined by the radiation field itself, and we have no local thermodynamic equilibrium. Cases in which the LTE assumption breaks down are occasionally encountered. Examples are in very rarefied gases, where the rate and/or effectiveness of interparticle collisions in redistributing absorbed radiant energy is low; when rapid transients exist so that the populations of energy states of the particles cannot adjust to new conditions during the transient; where very sharp gradients occur so that local conditions depend on particles that arrive from adjacent localities at widely different conditions and may emit before reaching equilibrium and where extremely large radiative fluxes exists, so that absorption of energy and therefore populations of higher energy states occur so strongly that collisional processes cannot repopulate the lower states to an equilibrium density. Now these LTE explanations are far removed from most people’s perceptions of what equilibrium means. And once this condition is met – which is almost always in the lower atmosphere – the Planck equation holds true. In the upper atmosphere this doesn’t hold true, because the density is so low. A subject for another time.. So much for Planck and Stefan-Boltzmann. But for real world surfaces (and gases) we need to know something about emissivity and absorptivity. There is an important relationship which is often derived. This relationship, Kirchhoff’s law, is that emissivity is equal to absorptivity, but comes with important provisos. The provisos for Kirchhoff’s law are that the emissivity and absorptivity are equal only for a given wavelength and direction. Or in the case of diffuse surfaces, are true for wavelength only. That is, the “thought experiment” which demonstrates the truth of Kirchhoff’s law is only true when there is a closed system with a body in equilibrium with its surroundings. Everything is at the same temperature and there is no heat exchanged with the outside world. That’s quite a restrictive law! After all, it corresponds to no real world problem.. Here is how to think about Kirchhoff’s law. The simple thought experiment demonstrates completely and absolutely that (under these restrictive conditions) emissivity = absorptivity (at a given wavelength and direction). Thus the extension of Kirchhoff’s law to non-equilibrium systems is not a result of simple thermodynamic considerations. Rather it results from the physics of materials which allows them in most instances to maintain themselves in LTE and this have their properties not depend on the surrounding radiation field. The hilarious paper by Gerlich and Tscheuschner poured fuel on the confused world of the blogosphere by pointing out just a few pieces of the puzzle (and not the rest) to the uninformed. They explained some restrictive considerations for Planck’s law, the Stefan-Boltzmann equation, and for Kirchhoff’s law, and implied that as a result – well, who knows? Nothing is true? Not much is true?Nothing can be true? I had another look at the paper today but really can’t disentangle their various claims. Except they don’t explain which ones. So no one can falsify their claim. And also, people without the necessary background who read their paper would easily reach the conclusion that the Stefan-Boltzmann equation had some serious flaws. All part of their entertaining approach to physics. I mention their papertainment because many claims in the blog world have probably arisen through uninformed people reading bits of their paper and reproducing them. The fundamentals of radiation are well-known and backed up by a century and a half of experiments. There is nothing controversial about Planck’s law, Stefan-Boltzmann’s law or Kirchhoff’s law. Everyone working in the field of atmospheric physics understands the applicability and limits of their use (e.g., the upper atmosphere). 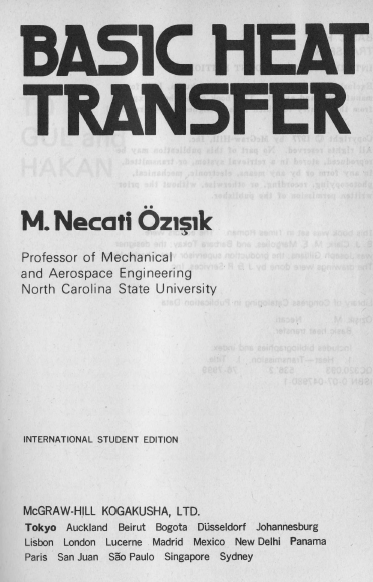 This is not cutting edge stuff, instead it is the staple of every textbook in the field of radiation and radiant heat transfer. 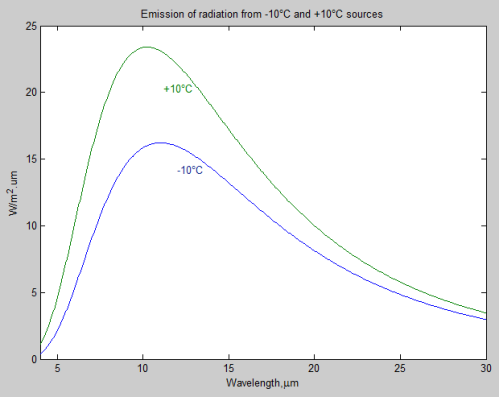 Note 1 – Because emissivity is a function of wavelength, and because emission of radiation at any given wavelength varies with temperature, average emissivity is only valid for a given temperature. 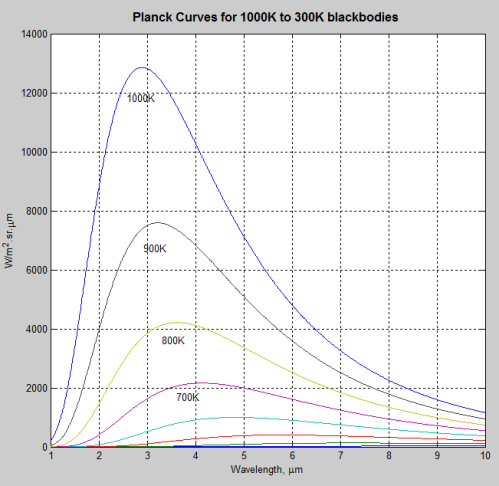 For example, at 6000K most of the radiation from a blackbody has a wavelength of less than 4μm; while at 200K most of the radiation from a blackbody has a wavelength greater than 4μm. Clearly the emissivity for 6000K will not be valid for the emissivity of the same material at a temperature of 200K. I have done a partial update of the Roadmap section – creating a few sub-pages and listed the relevant articles under the sub-pages. It is a work in progress, the idea is to make it possible for new visitors to find useful articles. Most blogs have a high bias towards the last few articles. Just a note as well for new visitors. There are many articles explaining some climate science basics. Many people assume from this – and from other simplistic coverage on the internet – that climate science is full of over-simplistic models. I don’t want to encompass all in a sweeping generalization.. but.. almost all comments I see on this subject are attacking simplistic models aimed at educating rather than models actually used in climate science. Providing a set of equations doesn’t prove anything is right. But my intent is to highlight that simple models are for illumination. It is easy to prove that simple models are simplistic. The science of atmospheres and climate is much more sophisticated than these models designed for illumination. Probably many, most or all of my readers wonder why I continue with this theme when it’s so completely obvious..
Well, most people haven’t studied thermodynamics and so an erroneous idea can easily be accepted as true. All I want to present here is the simple proof that thermodynamics textbooks don’t teach the false ideas circulating the internet about the second law of thermodynamics. So for those prepared to think and question – it should be reasonably easy, even if discomforting, to realize that an idea they have accepted is just not true. For those committed to their cause, well, even if Clausius were to rise from the dead and explain it.. Provide your reference that he said heat can spontaneously flow from cold to hot. And not from a climate ‘science’ text. 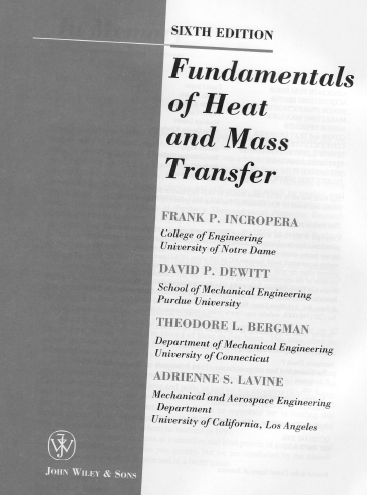 I had cited the diagram from Fundamentals of Heat and Mass Transfer by Incropera and DeWitt (2007). It’s not a climate science book as the title indicates. However, despite my pressing (you can read the long painful exchange that follows) I didn’t find out what the blog owner actually thought that the writers of this book were saying. Perhaps the blog owner never grasped the key element of the difference between the real law and the imaginary one. So I should explain again the difference between the real and imaginary second law of thermodynamics once again. I’m relying on the various proponents of the imaginary law because I can’t find it in any textbooks. Feel free to correct me if you understand this law in detail. Hopefully everyone can clearly see the difference between the two “points of view”. Everyone agrees that net heat flows from hotter to colder. There is no dispute about that. Now, let’s take a look at the radiative exchange that would take place under the two cases and compare them with a textbook. Even if you find maths a little difficult to follow, the concept will be as simple as “two oranges minus one orange” vs “two oranges” so stay with me..
We will keep it very simple for those not so familiar with maths. In typical examples, we have to consider the view factor – this is a result of geometry – the ratio of energy radiated from body 1 that reaches body 2, and the reverse. In our example, we can ignore that by considering two very long plates close together. E1 is the energy radiated from body 1 (per unit area) and we consider the case when all of it reaches body 2, E2 is the energy radiated from body 2 (per unit area) and we consider that all of it reaches body 1. We define Enet1 as the change in energy experienced by body 1 (per unit area). And Enet2 as the change in energy experienced by body 2 (per unit area). This should be uncontroversial. All I have done is written down mathematically what the two sides are saying. If we took into account view factors and areas then the formulae would like slightly more cluttered with terms like A1F12. In the case of the real second law, the net energy absorbed by body 2 is the net energy lost by body 1. In the case of the imaginary second law, there is some energy floating around. No advocates have so far explained what happens to it. Probably it floats off into space where it can eventually be absorbed by a colder body. Alert readers will be able to see the tiny problem with this scenario.. I could leave it there really. Why don’t the books say this? 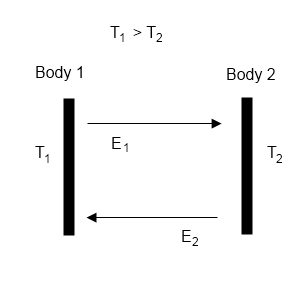 Note that if the imaginary second law advocates were correct, then the text would have to restrict the conditions under which equation 2.1 and 2.2 were correct – i.e., that they were only correct for the energy gain for the colder body and NOT correct for the energy loss of the hotter body. Note the circled equations – matching the equations for the “real second law” and not matching the equations for the “imaginary second law”. Note the highlighted area. Note the highlighted section, same comment as for the first book. Note the highlighted sections. The second highlight once again confirms the equation shown at the start, that under “the real second law” conditions, Enet1 = – Enet2. Under the “imaginary second law” conditions this equation doesn’t hold. Note the circled section. This is false, according to the advocates of the imaginary second law of thermodynamics. 1. 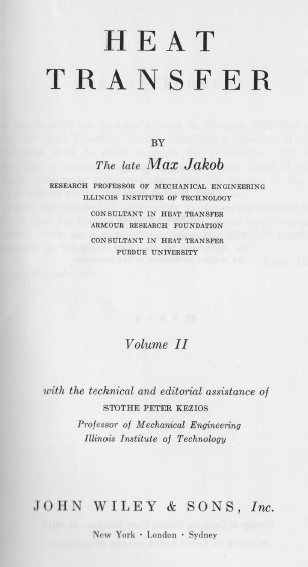 Professors in the field of heat transfer write rubbish that is easily refuted by checking the second law – heat cannot flow from a colder to a hotter body. 2. Climate science advocates have crept into libraries around the world, and undiscovered until now, have doctored all of the heat transfer text books. 3. (My personal favorite) Science of Doom is refuted because these writers all agree that net heat flows from the hotter to the colder. 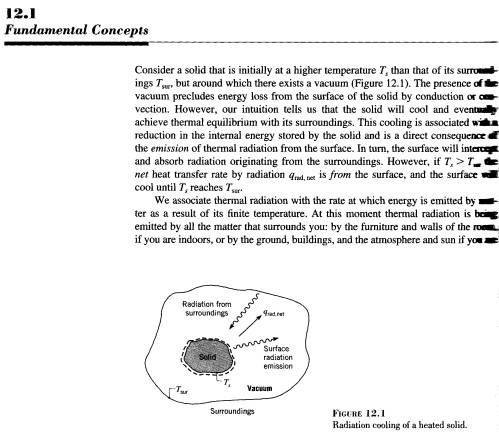 Note 1 – Strictly speaking a hotter body might radiate less than a colder body – in the case where the emissivity of the hotter body was much lower than the emissivity of the colder body. But under those conditions, the hotter body would also absorb much less of the irradiation from the colder body (because absorptivity = emissivity). And so net heat flow would still be from the hotter to the colder. To keep explanations to a minimum in the body of the article in 1e and 1f I also didn’t state that the proportion of energy absorbed by each would depend on the absorptivity of each body. 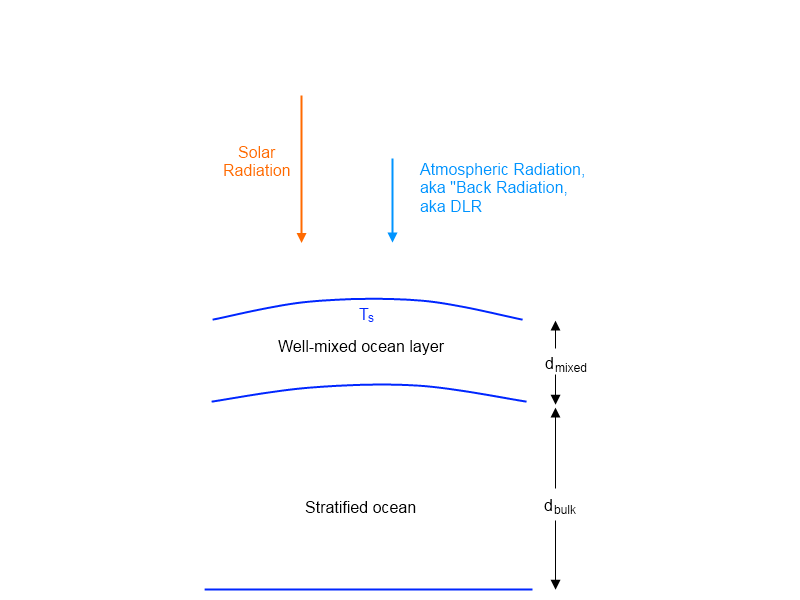 In the three part series on DLR (also known as “back radiation”, also known as atmospheric radiation), Part One looked at the network of stations that measured DLR and some of the measurements, Part Two reviewed the spectra of this radiation, and Part Three asked whether this radiation changed the temperature of the surface. Very recently, on another blog, someone asked whether I thought “back radiation” heated the ocean. I know from a prominent blog that a very popular idea in blog-land is that the atmospheric radiation doesn’t heat the ocean. I have never seen any evidence for the idea. That doesn’t mean there isn’t any..
See note 1 on “heat”. 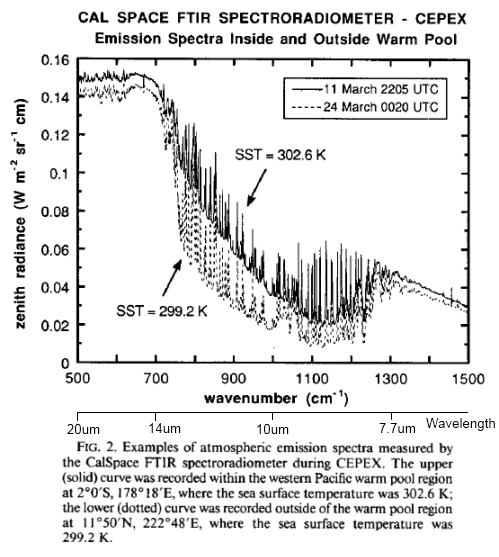 Therefore, solar radiation heats the ocean, but atmospheric radiation only heats the top few molecules. So DLR is unable to transfer any heat into the bulk of the ocean, instead the energy goes into evaporating the top layer into water vapor. This water vapor then goes to make clouds which act as a negative feedback. And so, more back-radiation from more CO2 can only have a cooling effect. There are a few assumptions in there. Perhaps someone has some evidence of the assumptions, but at least, I can see why it is popular. 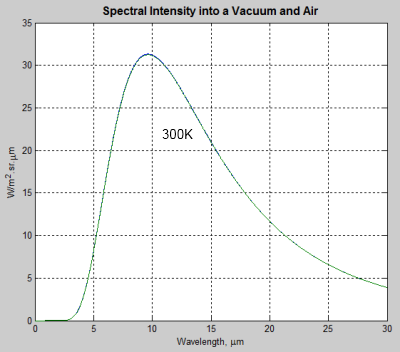 As regular readers of this blog know, plus anyone else with a passing knowledge of atmospheric physics, solar radiation is centered around a wavelength of 0.5μm. The energy in wavelengths greater than 4μm is less than 1% of the total solar energy and conventionally, we call solar radiation shortwave. 99% of the energy in atmospheric radiation has longer wavelengths than 4μm and along with terrestrial radiation we call this longwave. Most surfaces, liquids and gases have a strong wavelength dependence for the absorption or reflection of radiation. Here is the best one I could find for the ocean. It’s from Wikipedia, not necessarily a reliable source, but I checked the graph against a few papers and it matched up. The papers didn’t provide such a nice graph.. 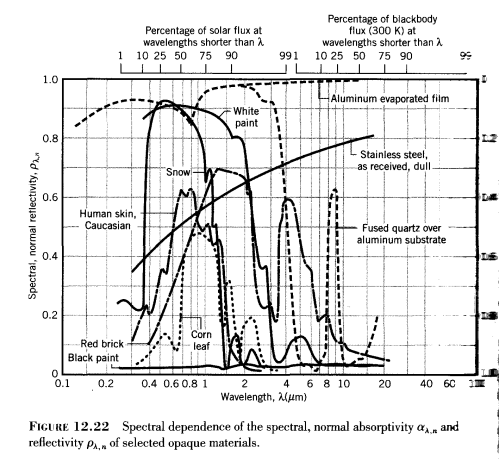 The first obvious point is that absorption varies hugely with the wavelength of incident radiation. So at 1m, 37% of the original radiation is transmitted (and therefore 63% is absorbed). At 2m, 14% of the radiation is transmitted. 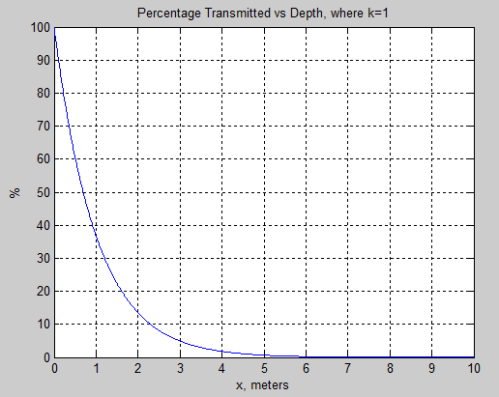 At 10m, 0.005% is transmitted, so 99.995% has been absorbed. 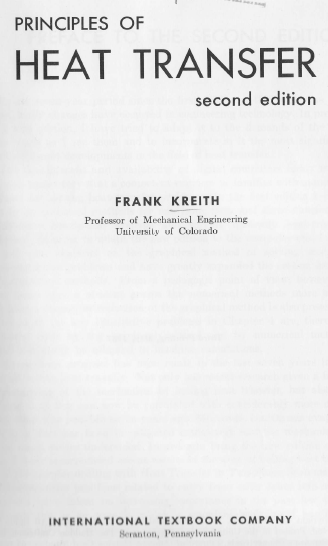 (Note for the detail-oriented people, I have used the case where k=1/m). Hopefully, this concept is reasonably easy to grasp. 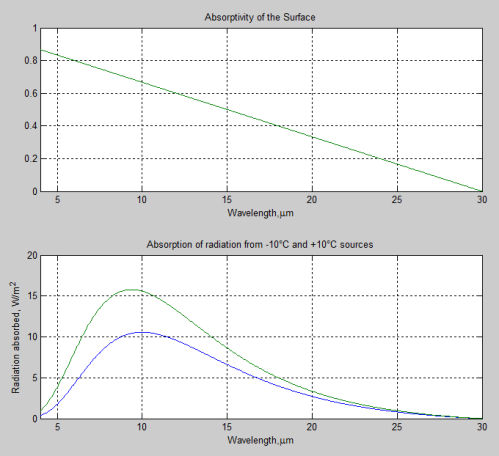 Now let’s look at the results of the whole picture using the absorption coefficient vs wavelength from earlier. 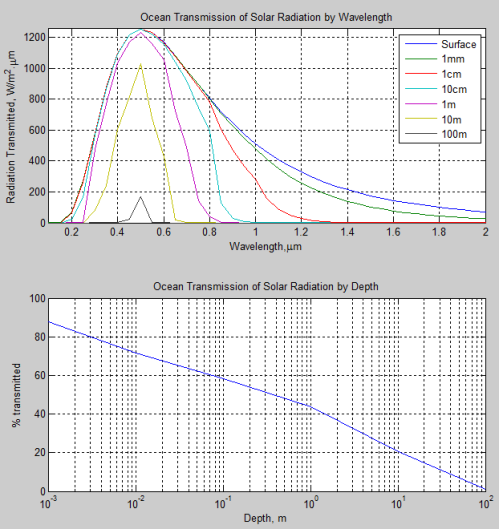 The top graph shows the amount of radiation making it to various depths, vs wavelength. As you can see, the longer (and UV) wavelengths drop off very quickly. 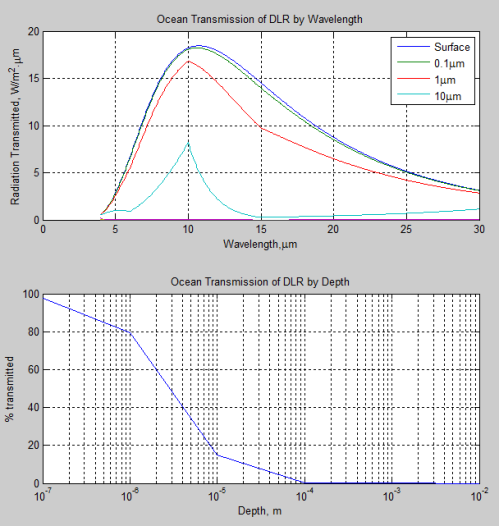 Wavelengths around 500nm make it the furthest into the ocean depths. 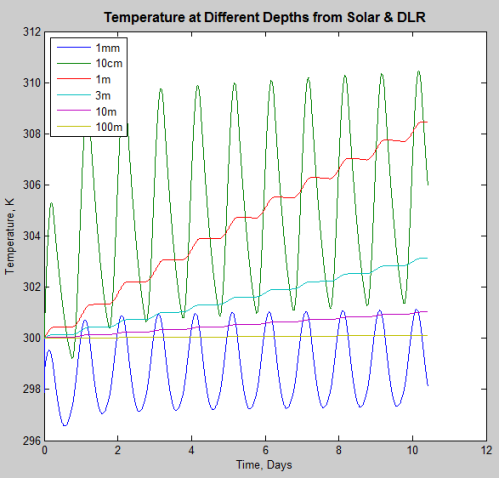 The bottom graph shows the total energy making it through to each depth. You can see that even at 1mm (10-3m) around 13% has been absorbed and by 1m more than 50% has been absorbed. 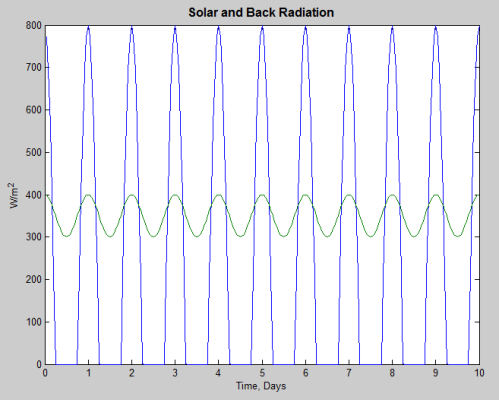 By 10m, 80% of solar radiation has been absorbed. 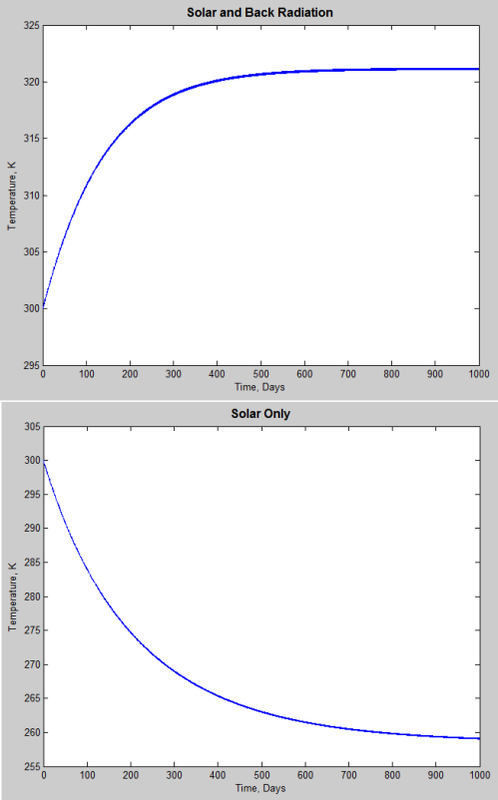 The graph was constructed using an idealized scenario – solar radiation less reflection at the top of atmosphere (average around 30% reflected), no absorption in the atmosphere and the sun directly overhead. The reason for using “no atmospheric absorption” is just to make it possible to construct a simple model, it doesn’t have much effect on any of the main results. If we considered the sun at say 45° from the zenith, it would make some difference because the sun’s rays would now be coming into the ocean at an angle. 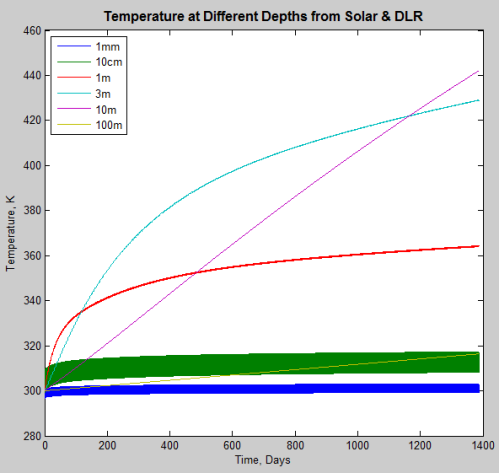 So a depth of 1m would correspond to the solar radiation travelling through 1.4m of water (1 / cos(45°)). 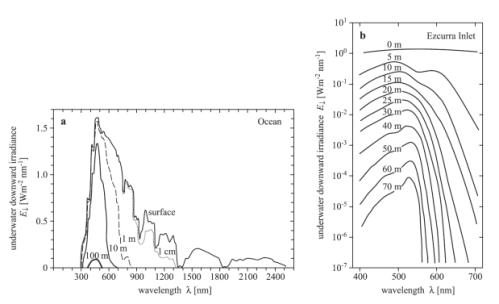 On the left the “surface” line represents the real solar spectrum at the surface – after absorption of the solar radiation by various trace gases (water vapor, CO2, methane, etc). On the right, the amount of energy measured at various depths in one location. Note the log scale on the vertical axis for the right hand graph. (Note as well that the irradiance in these graphs is in W/m².nm, whereas the calculated graphs earlier are in W/m².μm). And two more locations measured. 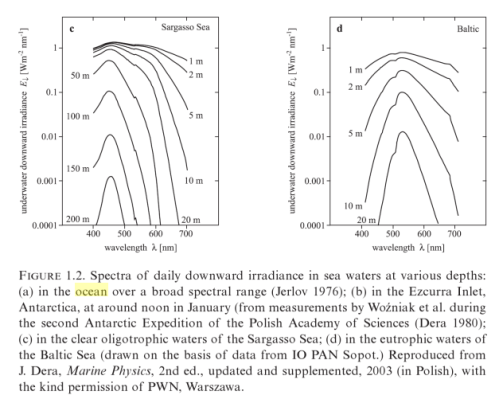 Note that the Black Sea is much more absorbing – solar absorption varies with sediment as well as other ocean properties. The radiation from the atmosphere doesn’t look too much like a “Planck curve”. Different heights in the atmosphere are responsible for radiating at different wavelengths – dependent on the concentration of water vapor, CO2, methane, and other trace gases. You can see more of these in The Amazing Case of Back Radiation – Part Two. 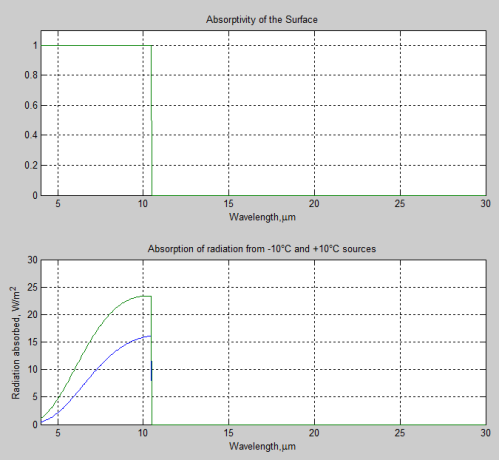 As you can see, most of the “back radiation” is absorbed in the first 10μm, and 20% is absorbed even in the first 1μm. I could produce a more accurate calculation by using a spectrum like the Pacific spectrum in fig 6 and running that through the same calculations, but it wouldn’t change the results in any significant way. 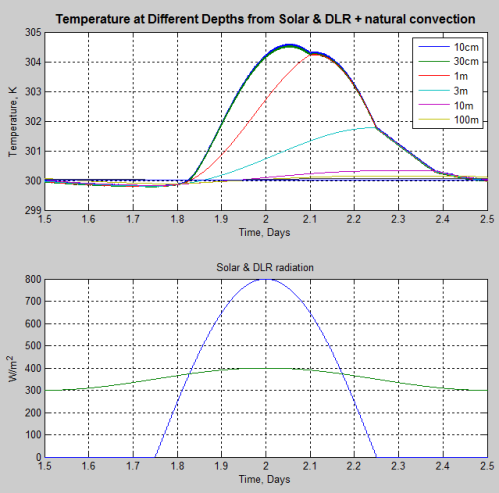 So we can see that while around half the solar radiation is absorbed in the first meter and 80% in the first 10 meters, 90% of the DLR is absorbed in the first 10μm. So now we need to ask what kind of result this implies. When you heat the surface of a body that has a colder bulk temperature (or a colder temperature on the “other side” of the body) then heat flows through the body. Conduction is driven by temperature differences. 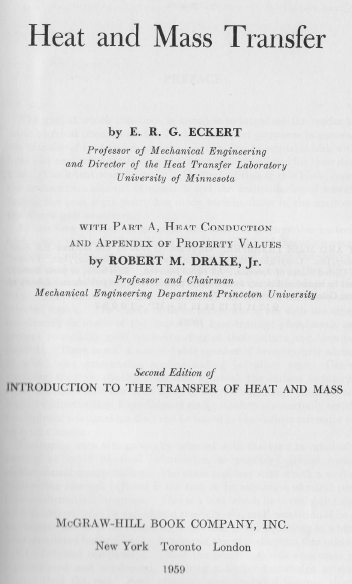 Once you establish a temperature difference you inevitably get heat transfer by conduction – for example, see Heat Transfer Basics – Part Zero. where k is the material property called conductivity, ΔT is the temperature difference, Δx is the distance between the two temperatures, and q is the heat transferred. However, conduction is a very inefficient heat transfer mechanism through still water. For still water, k ≈ 0.6 W/m.K (the ≈ symbol means “is approximately equal to”). So, as a rough guide, if you had a temperature difference of 20°C across 50m, you would get heat conduction of 0.24 W/m². And with 20°C across 10m of water, you would only get heat conduction of 1.2 W/m². However, the ocean surface is also turbulent for a variety of reasons, and in Part Two we will look at how that affects heat transfer via some simulations and a few papers. We will also look at the very important first law of thermodynamics and see what that implies for absorption of back radiation.